Stephen Glennon, who announced his decision to step down as manager of the Galway Senior Ladies. Galway Ladies Football are on the hunt for a new senior manager after Stephen Glennon announced his decision not to continue for a third season. Glennon, who has brought considerable cohesion and success to the senior side in his two seasons, is unable to continue due to pressure of other commitments. 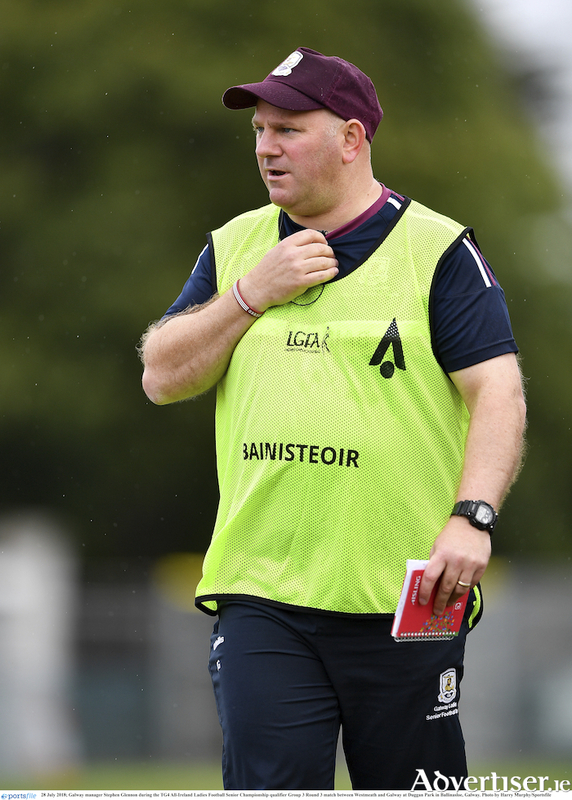 "After a great deal of consideration, it is with regret that I have decided not to continue for a third year as Galway senior ladies football manager," Glennon said. "It is a decision I have not come to lightly but, unfortunately, I am unable to give the role – and these magnificent bunch of players – the 100 per cent commitment and dedication they deserve in 2019. This decision I cannot subscribe to any one reason, but to many – family, work and college, among them." Glennon said last year was one of the "most enjoyable" of his life. "A finer squad of players you could not work with. The sacrifices they make correlate with those made by elite sportspeople across the other GAA codes and sporting disciplines and, yet, they receive a fraction of the recognition, support, or financial backing of their peers. "Their willingness to learn, embrace a vision and drive it forward is a credit to them, and I sincerely hope it is not too long before they can secure national honours at senior level. "I don’t wish to single out any one player, but it would be remiss not to thank Emer Flaherty and Tracey Leonard, Galway captains in 2017 and 2018 respectively, along with 2017 Galway U21 joint captains, Megan Glynn and Michelle Joyce, both of whom spearheaded our successful bid for All-Ireland Aishling McGing Cup glory last November." Glennon believed the senior set-up is already "moving in the right direction". "In addition to the All Ireland U21 victory, in the last two years alone, the senior team has won two Winter Leagues and back-to-back Connacht titles. Also, in the last two campaigns, we were knocked out by the then reigning All-Ireland champions, namely Cork in 2017 and Dublin in 2018. The side has also contested two National League semi-finals while, the summer just past, the senior team appeared in an All-Ireland semi-final for the first time since 2014. "Although that semi-final defeat to Dublin last August was disappointing – and did hurt – I would urge the players to bear in mind that Dublin were playing in their fifth consecutive All-Ireland semi-final and the experience of that was vital. Underlining this, Dublin had 16 survivors from their 2014 squad, which edged the Tribeswomen in that year’s semi-final. Of that 16, 13 of those Dublin survivors started – with another also featuring off the bench – in the game last August, 14 out of the 16. Galway, for their part, had five starters from 2014. So, I would urge the players to stay the course and be patient and not settle for anything less than they deserve, on or off the field." Thanking his wife Edel and children for "the sacrifices they have made so I could pursue the sporting opportunities that have fortunately come my way", he also paid tribute to his management team Michael Comer and Tim Rabbitte (coaches ) and selectors Noel Kelly and Ciara Moran (the glue of the operation ). "I want to express my deepest gratitude for the significant amount of time and effort that they put in. Quite often, it was above and beyond the call of duty and, from a personal point of view, I learned so much from each of you, as I know did the players. "Of course, I would also like to thank the County Ladies Board, the clubs and the delegates for giving me the opportunity to work with a serious group of players. With so much underage success over the last number of years, I would implore the board, clubs and delegates to firmly establish their vision going forward – objectives and goals – and determine how best these can be achieved."